Trying to get back in the swing after our vacation and subsequent bout with sickness, but not swinging really hard just yet. I have a lot to say about our vacation experiences in terms of parenting around other people, but I'm not sure when I'll get it out. Hopefully soon, so I don't explode. Here are a few clicks for you. "Body Image Problems: Who's to Blame?" from Momopoly: This is another recent article akin to my post on losing weight and keeping self-worth. I've come to the same realization, more than once: I have to take responsibility for liking myself and treating myself well. To do otherwise harms not only myself but others as well. "Mom follows her instincts, revives 'dead' preemie with Kangaroo Care" from Crunchy Domestic Goddess: Wow. I wish more doctors knew about kangaroo care, don't you? "Breastfeeding the nursing child after delivery of the next child (tandem nursing) may help provide a smooth transition psychologically for the older child." "No-Sew Wrap" from Anktangle: No-Sew Wraps are the bomb! "Your Six Year Old Will Not Remember Your Problems…" from Ragamuffin Soul: Sharing this not to heap guilt on anyone making a different choice at any given time — just to remind myself to make the decision toward the fleeting family moments more often. "Being Carfree Means Being More Visible" from Carfree With Kids: We're not car-free, but we use public transportation a lot since living in a city. This is one reason I enjoy public transportation so much, even though it can lead to those embarrassing meltdown-in-public moments (Mikko's or my own…) — I have felt so much minutes-long community in the back of the bus, with strangers reaching over with a friendly high-five and a smile. I even thought it was pretty funny when we were in Boston on a very full bus, standing squished by the doors, when Mikko piped up to say, pointing at the lucky riders with seats, "If these people just get off, we could sit down." As promised, Zoey of Good Goog gave me a guest post on "Work, identity and staying at home," discussing the nuances of what a mother calls herself when she's not working out of the home. I think it's interesting, because what Zoey does as a writer seems still like work to me, but maybe that's because that's mostly what I do these days. It's finally that time again! After a month's hiatus, we joyfully request your submissions to the September Carnival of Natural Parenting. 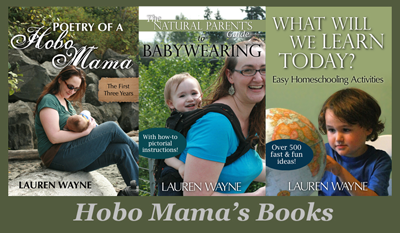 The topic is on learning at home, and we'd love to hear all perspectives, whether you intentionally homeschool/unschool or not. Children are learning all the time, so we all have stories and insights into how that free-form education happens. You're free to talk more generally and philosophically about what you believe about educating, to take us through a day in the life of learning at home, or to give details of one or more specific activities your children enjoy. Submissions are due this Tuesday night, September 7. I finally got up a review of the WondaWedge inflatable back support pillow! You can see it in action on the beach and in bed, and then enter to win your own WondaWedge by Tuesday, September 7. The flippable wedge shape allows for comfortable sitting, reclining, or lying down, and the attached mat that sits under your body keeps the pillow in place. It inflates easily and then deflates to take up next-to-no room in your suitcase or tote bag. We've used ours for reading on the beach and nursing in bed, and I plan to use it when I go to outdoor concerts or picnics where I have to sit on the ground, to support my back or elevate my legs if'n I get pregnant again, and to keep my head comfortably raised when I have a cold. 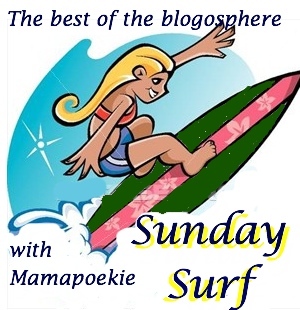 Check out Authentic Parenting, Baby Dust Diaries, Maman A Droit, Navelgazing, and pocket.buddha for more Sunday Surfing! Thanks again for the link love!